A trip to Bristol over the weekend was my first visit to the city and was certainly worth the long train journey and the inevitable bus replacement service that was in operation. 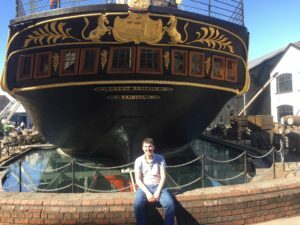 Whilst I should admit the main reason behind the trip was the Bristol Beer Festival I did at least take in some culture by visiting the SS Great Britain. She has been wonderfully restored both inside and out and you are also able to explore a special dehumidified area underneath the ship which was installed to stop the iron hull from rusting further. 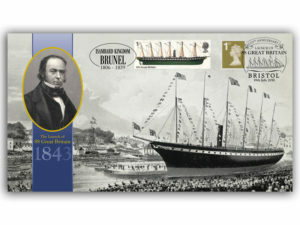 Designed by Isambard Kingdom Brunel the SS Great Britain was a true technological innovation in being the first ship to be both built of iron and equipped with a screw propeller. These improvements led to her becoming the first iron steamer to cross the Atlantic, doing so in 1845 in only 14 days. After many years in service and multiple voyages around the world she was scuttled in the Falklands in 1937 and laid there until an incredible operation to refloat and tug her across the Atlantic saw a triumphant return to Bristol in 1970. 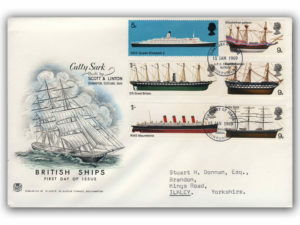 The ship has featured on stamps including the 1969 GB Ships issue (FC709 at £10), and has been the subject of numerous commemorative covers over the years. In fact the museum at Bristol had one of the 1970 Falklands FDCs which celebrated the ship in their display, we have many customers on a waiting list for that exact cover at the moment but I wasn’t able to buy the one they had! In 2018 we produced our own cover celebrating the 175th anniversary of the launch (BCN018 at £10.95), and currently have a very limited stock left.